Wide-local excisions are often used for basal cell carcinomas or squamous cell carcinomas, especially those which have recurred, and for malignant melanomas. The initial treatment for a suspected melanoma is to cut out (excise) all of the melanoma cells. 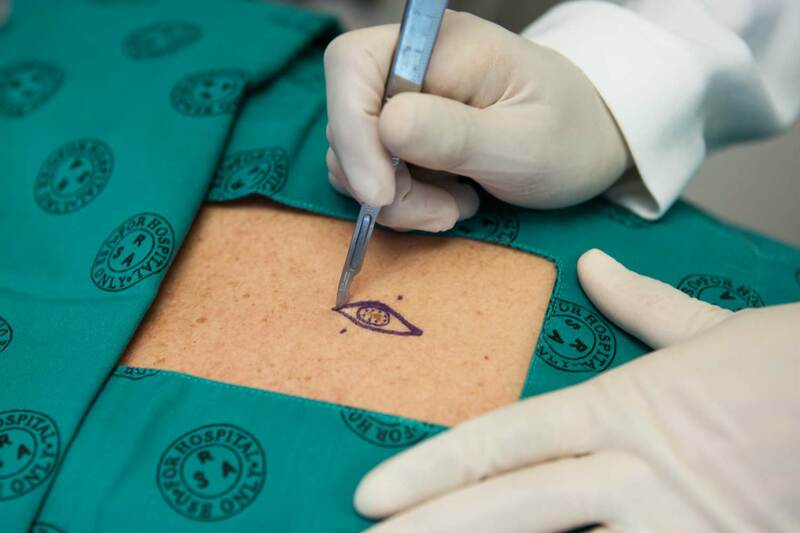 When the lesion is first removed, we do not know for sure if it is a melanoma or not, and if it is a melanoma how thick it is, so the excision is usually done with narrow margins (the area of normal skin around the suspected melanoma). The specimen that is cut out from the skin is sent to a laboratory, so that a pathologist can examine it under the microscope. Pathologists look to see if what has been removed is a melanoma and how thick it is. Once the diagnosis of a malignant melanoma has been confirmed, a wide local excision will be done. During this procedure, the lesion and a small margin of healthy tissue around it is cut out, usually in a rugby-shaped ellipse. The amount of normal surrounding tissue which needs to be removed depends on how advanced the melanoma is. The reason for taking a margin is to remove any cancer cells that have spread into the normal-appearing surrounding tissue. Once the tissue has been removed, the edges of the wound are sutured or stitched together. The tissue then is sent for processing and margin evaluation by a pathologist to make sure that all the margins are clear of the malignancy with a wide enough rim of normal tissue. If caught early, the procedure can cure melanoma. In other cases, additional treatments may be required. Since wide-local excision requires the removal of healthy skin, it results in a larger scar. In certain places on the body, such as the head and scalp, it can be difficult to suture the wound edges back together, necessitating skin flaps or grafts to close the wound. Recovery time can vary greatly depending on the size and site of the cancer. We will provide you with detailed post-procedure care instructions and are here to hold your hand through the healing process. We care about the cosmetic outcome of your procedure and have many tricks up our sleeves to make your scars as subtle as possible.